The aircraft droning noise in Aerograd reminded me of this particularly effective scene from “The North Star (1943, U.S.A.)”, a black sheep of Hollywood propaganda directed by Lewis Milestone. Samuel Goldwyn produced this well-known war film about an Ukrainian village under attack by Nazis, to promote “neighborly” feeling toward the Communist Nation of the Allies. In this scene, as the German bombers and fighters are approaching the village, Dana Andrews and Co. can hear the sound of the enemy aircrafts but cannot visually spot them. The soundtrack contrasts pastoral sound of the imaginary Ukraine with a faint buzz of the approaching aircrafts. 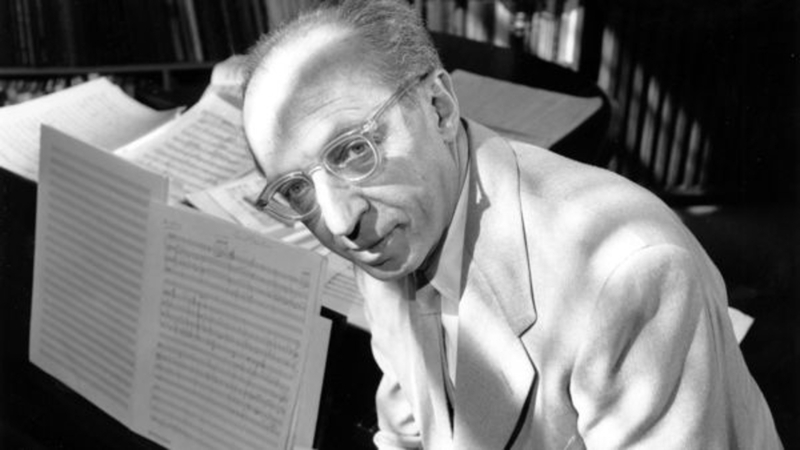 Aaron Copland composed the film score for “The North Star”. The scene of village attack by Nazis is superbly staged and I believe this is the most impressive use of “The Internationale”, socialist/communist party song, in the film history. I don’t know who did this arrangement, but IMDB lists Gil Grau, Jerome Moross, and Arthur Morton as the orchestrators. Jerome Moross was one of Copland’s protegee, (in 1932, Copland formed an informal group of young composers, called “the Young Composer’s Group”, which included Elie Siegmeister, Arthur Berger, Israel Citkowitz, Vivian Fine, Jerome Moross and Henry Brant) and did many orchestration works on Aaron Copland’s film music works, including “Our Town” and “The Best Years of Our Lives”. Of course Moross went on to become one of the most celebrated film composers in the latter half of 20th century, particularly notable for works for western films. In the vast plains like those in the Soviet, you might hear the long droning of engine buzz as a sign of an approaching aircraft.